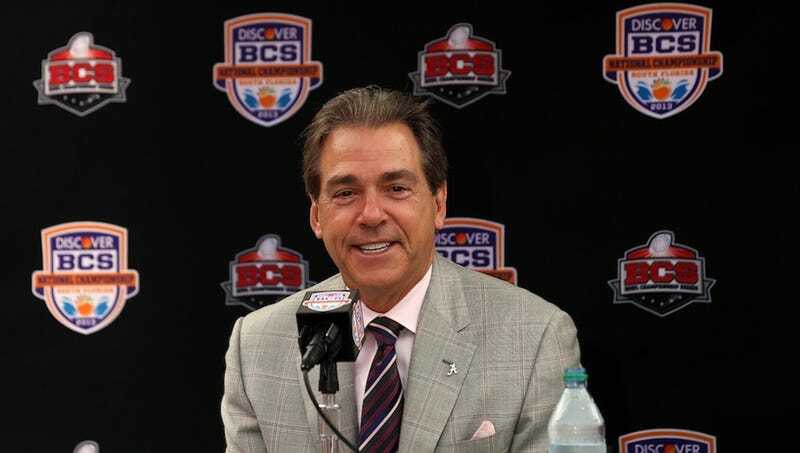 AL.com's Jon Solomon has written a wonderful article about the die-hard Alabama fans who flock to SEC media days with the hope that they will get a chance to meet Nick Saban. Some arrive looking for an autograph, others want to give gifts to Saban, and some just come to pay their respects—and also to glowingly compare Saban to Hitler. So that's terrifying. But I suppose we should all be thankful that Lee is just a tobacco-spittin' yutz from Decatur, and not someone who came of age in Germany right around, say, the fall of the Weimar Republic. Be sure to read the rest of Solomon's article in order to get the complete picture of Saban's worshippers. They may actually be crazier than Saban himself.